Irwin Shope was born on his father’s Circle Arrow Ranch in the Boulder Valley of Jefferson County, Montana on May,11, 1900. He would later use his father’s brand, a circle arrow, to sign his work. When Shope was twelve years old his father, Ira, passed away and his mother, Emilie, moved the family to Missoula where he met and was mentored by the highly-respected artist, Edgar S. Paxson. Following high school Shope, in 1919, attended the Portland Art Academy and Reed College, later enrolling in Montana State University (now University of Montana) in Missoula. Always drawn to the ranch life, Shorty alternated between cowboying in the summer and spring and schooling in the winter. It was during these years that he perfected his skills to accurately portray the western ranch scene and the cowboys and horses that inhabited it. After graduating with his degree in fine art and history in 1932 Shope studied under Howard Dunn at Grand Central School of Art in New York City, and in Minneapolis. Shope began a career in illustration and quickly received commissions for books and magazine covers. He also painted murals for the University of Montana, the Montana Highway Dept. and numerous commercial institutions in Helena. His time with the Montana Highway Dept., beginning in 1935, produced many widely-distributed maps, brochures and posters. 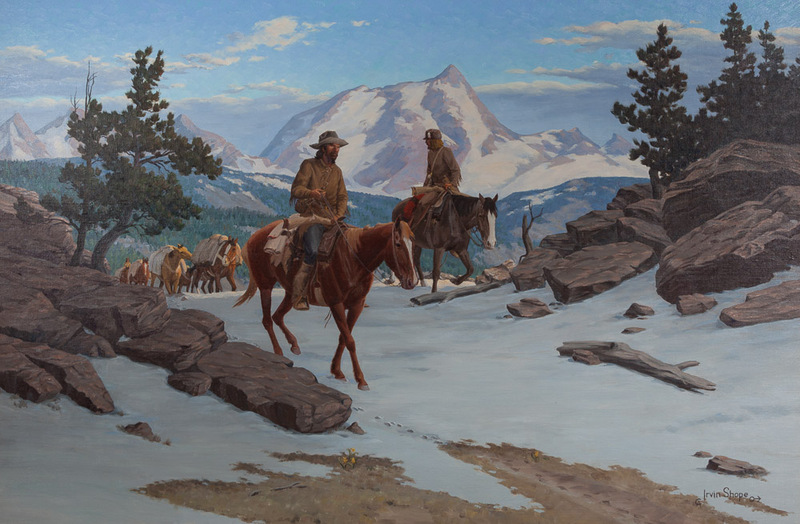 He later became chief graphic artist for Montana Power Co.
Shorty’s oil paintings depict a wide swath of western subject matter including cowboys, trappers, outlaws, Canadian Mounties, western landscapes and Blackfeet Indians. Shope was voted into the National Cowboy Artists Association in Oklahoma City in 1966 and became the first Montana artist to be exhibited in the Cowboy Hall of Fame. In 1972 Shorty received the U of M Distinguished Service Award as recognition of his artistic contributions to Montana. Shope’s paintings have been exhibited at the Grand Central and Kennedy Galleries in New York and the Desert Southwest Gallery in California.